Quba is a region on the northern part of Azerbaijan. The region has a population around 130000 people. The centre of the region- Quba city is among the biggest cities of Azerbaijan. It is located on the slopes of Greater Caucasus. With its 38000 population, Quba is the main town in northern Azerbaijan. The name Quba was first mentioned by European and Arab geographers. However, as a city, it was founded in 18th century by Fatali khan, local ruler of Quba Khanate. The city is home to many historical buildings and sites, including the Juma Mosque (Friday Mosque), Ardabil Mosque and old hamams (baths). Architecture here still bears the marks of medieval time Azerbaijan and Russian Empire. The population here is very multi-ethnic. Population of Quba consists of Azerbaijan people, Tats, Lezgins, Jews, Khinalyg people, Qriz, Russians and so on. 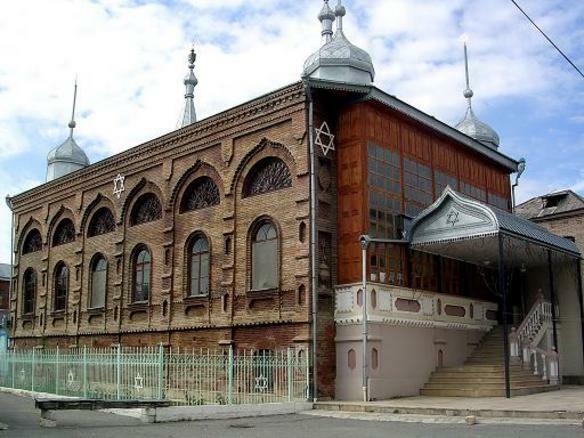 In fact, the biggest Jewish population of Azerbaijan is living in Quba- in “Red town” (Krasnaya Sloboda) settlement. It is the only entirely Jewish settlement outside of Israel and the United States. The settlement has been inhabited by Jews since the 13th century. There are several working Synagogues here. Moreover, visitors can see Star of David everywhere in the settlement. Jewish cemetery is laying on the top of the hill, looks the marvellous panorama of Caucasus. The city is very famous with its carpets, amazing landscape and traditional delicious sweets. If you come here, you can watch famous carpets being made at Old Quba. Visitors can buy handmade carpets from nearby small boutique along with handicrafts and local sweets- especially delicious pakhlava. Due to its beautiful nature and mild climate, the region is a popular destination for weekenders usually coming from capital- Baku. During winter people travel to the nearby Shahdag Skiing Resort, a world-class ski resort of Caucasus. In the summer, people from all around Azerbaijan visit Quba to escape from the heat. Afurdzhin Waterfall-the highest waterfall of Azerbaijan. In translation from Russian, Afurdja means “a place where water splashes fall”. Indeed, the waterfall is very splashing. Juma Mosque- 19th century mosque constructed in typical Guba province style mosques. Inside of the mosque there is a big hall with a huge 16 m diameter dome. Old Hamam- not far from the Juma Mosque, the hamam is unique with its beehive shaped dome. It is no longer operational but proves to be an interesting stop on any walking tour.